I would like to introduce "The Irrigation Computer". This thing is the brain of the irrigation system and it is one of the most important tools we have for managing the playing surfaces that make up the golf course. It would literally take me hundreds of pages on this blog post to explain half of what this thing can do so I won't even attempt it. Right now I just want to show you my new Map screen. The current software we're using to control the irrigation system (IR) is called "Lynx". 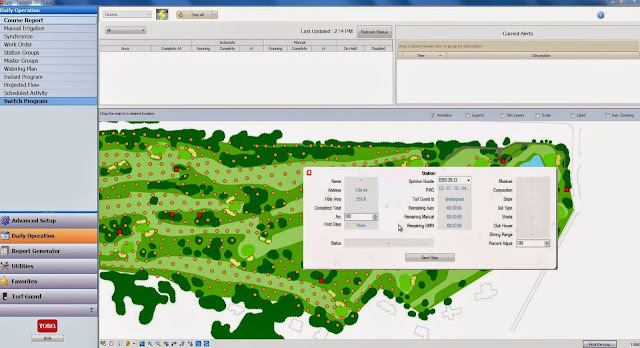 Lynx is the newest and latest and greatest software made by TORO. We were one of the first to get this new software and it is nothing short of amazing. Lynx was created with a completely new platform and a completely different way of thinking compared to previous programs. This new stuff is very intuitive so it's much easier and faster to make adjustments. When somethings easier and faster we can do more of it. The more daily adjustments that are made, the better the playing field gets. Anyway, I want you to see my new map screen. We've been using Lynx for a few years now but without the map screen. That's because our irrigation system is now 25 years old and back when it was designed, the technology for GPS mapping didn't exist. We could have the system mapped with GPS but now with Lynx we don't need to because the software allows you to make your own map with just a photo of your course. So check out the lower half of my screen in the image above. 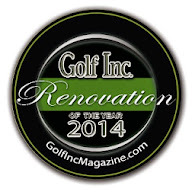 The photo I'm using to make my map is our most updated master plan by DMK golf design. In the center of the map screen above you see 10 and 17 green and then all those yellow dots are sprinkler heads. Right now I'm still working on getting this map ready for the upcoming season. See when I scroll over to the south end of the property there are no yellow dots on holes 13 through 16. It takes some time to input the data necessary to create the dot for each sprinkler but it is so worth it. By having the map, we no longer need to refer to our crude hand drawings for each hole in order to find the address for each sprinkler. We just need to click on a dot on the map and this box pops up. This box displays all the necessary information about the selected sprinkler. Here's a closer look at the box. You can see this sprinkler has an address, a code that describes the area it is in, the type of nozzle, and obviously some other stuff but in the bottom right is that window that says "percent adjust". This is where I can turn that sprinkler up or down. Right now you see this sprinkler is at 100%. So if this was a sprinkler on one of the greens and I decide to water greens for 10 minutes then it will water for 10 minutes. If I change the "percent adjust" to 50% and run greens for 10 minutes then this sprinkler will run for 5 minutes. There are 1200 sprinklers on the course and each one of them has their own "percent adjust" which is based on the water needs for that particular area. Some areas require more or less water than other areas depending on the environment in that sprinkler's area, soil type, grass type etc. The environment is not a constant. A sprinkler that is in full sun in the spring can be in part shade in the fall and vice verse. Since the environment is not a constant, we need to make adjustments to many of the sprinklers almost every day in order to provide a consistent moisture level across the playing field. Before we had map, we had to navigate through a menu like you see below in order to find the address for the sprinkler we wanted to adjust. Now of course with the map, it is so much easier to quickly find the sprinkler we want to adjust. This will reduce the time we spend making adjustments so now we can make better use our time. You got to hand it to the TORO company. They have made countless advancements with irrigation central controllers and all the while allowing many older systems to upgrade and take advantage of these improvements. Installed in 1989, the irrigation system at Tacoma was one of the first computer controlled systems made and today I'm using the most advanced computer system to run it. Think about that for a minute. It's astonishing. Thanks TORO!